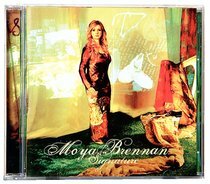 Moya Brennan - the first lady of Celtic music - returns with an album that continues to push the boundaries, that inspires and intrigues. SIGNATURE looks back over a life less ordinary and portrays her experiences through a collection of twelve superb tracks. Musically sharp and finely tuned, the album cleverly treads a fine line between the contemporary and the traditional while Moya emerges as a skilled songwriter with a global ear.